There is no creature more feared in this world than the crocodile. A silent hunter that stalks the shallows of coastal waterways and inland estuaries, the crocodile is a powerful killer capable of striking at a moment’s notice. 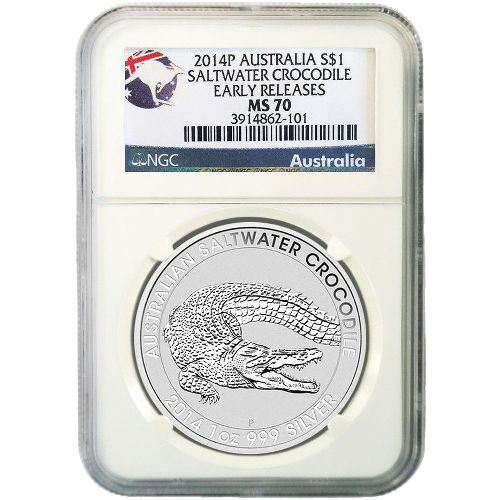 Australia is home to some of the deadliest and largest saltwater crocodiles in the world, and the Perth Mint has included these efficient predators on the 2014 1 oz Silver Australian Saltwater Crocodile Coin. 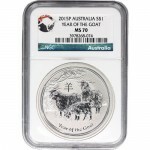 You can purchase one of these coins today from Silver.com with an MS70 grade from the Numismatic Guaranty Corporation. 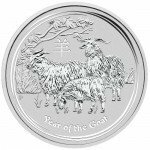 Each coin is also part of the early release series, which indicates it arrived from the mint within the first 30 days of its release. There are only 72 coins with this certification and designation! Highlights one of Australia’s deadliest natural predators! Issued a grade of Mint State 70 by the Numismatic Guaranty Corporation. Features the image of the deadly saltwater crocodile on the reverse. Saltwater crocodiles are the largest of all living reptiles, which makes them one of the largest terrestrial predators in the world. These crocodiles are affectionately referred to as “salties” in Australia. Male saltwater crocs can grow to a length of 22 feet and weigh upwards of 4,000 lbs. The saltwater crocodile is powerful enough to take down fully grown wild boars, deer, and other large mammals, but will go after any game that satisfies its appetite. On the reverse side of the 2014 1 oz Silver Australian Crocodile coin is the image of a large male crocodile. The impressive beast is featured with its mouth wide open, ready to snap shut at a moment’s notice. Engravings on this side include “Australian Saltwater Crocodile,” the weight, purity, and metal content of the coin. The obverse side of the coin feature’s Ian Rank-Broadley’s classic right-profile portrait of Queen Elizabeth II. 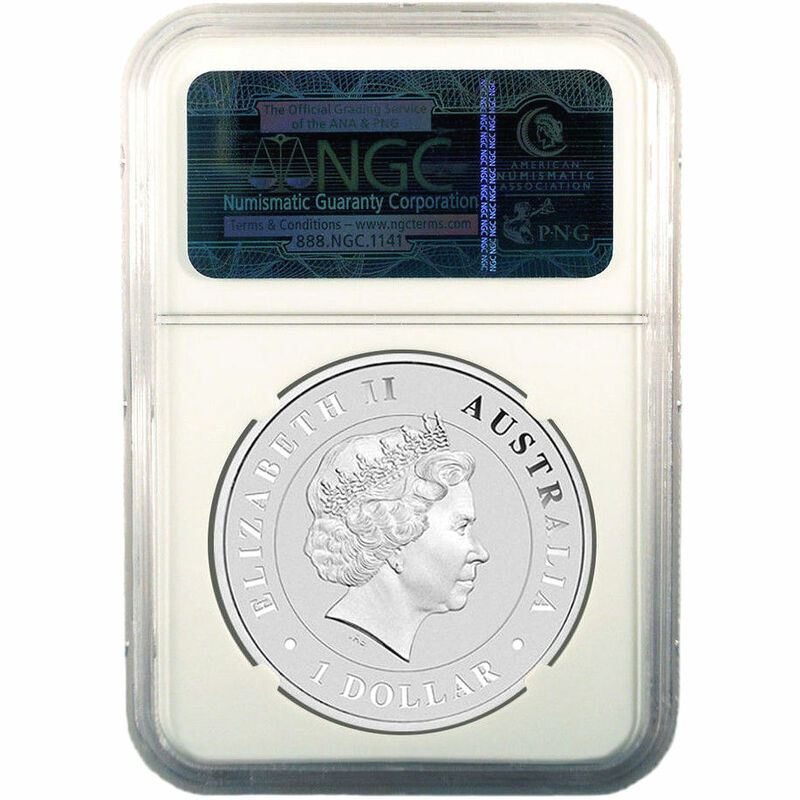 Her Majesty’s image is encircled by engravings that read “Elizabeth II,” “Australia,” and the face value of the coin in Australian dollars (AUD). The Perth Mint is the last remaining facility from the Royal Mint system established by the British when Australia was a colony. Following the closure of the Sydney and Melbourne facilities, the Perth Mint became the oldest operating mint in Australia. An MS70 grade from the NGC indicates these coins are perfectly minted and have no blemishes. If you have any questions about these Saltwater Crocodile Coins, other Silver.com products, or the online purchasing process, don’t hesitate to call our associates at 888-989-7223. You can also contact us on the web using our live chat service.